When Mark Miller bought a metal print at a craft show, he quickly realized he could be selling his own photographs. Each year, Miller and his wife travel to Europe, Hong Kong, the Philippines and elsewhere. While traveling, Mark takes thousands of pictures, a tiny fraction of which are sold at craft shows. He says he doesn’t have the latest camera and he isn’t especially interested in fancy technology. What he does have is a good eye for photo composition and a willingness to ask other photographers for tips to improve his technique. Mark likes taking cruises since this makes it easy to photograph many cities on one trip. His favorite destination is whichever one he visited most recently. His photography time is limited since he also works as a call center manager during the week. 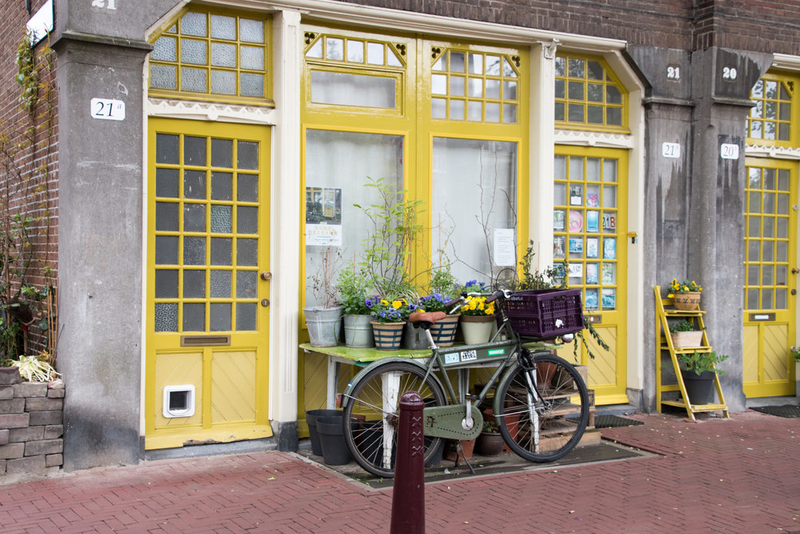 Out of his thousands of photographs taken in Paris, Holland, Belgium, Amsterdam and other locales, his best selling photo (and also his favorite) is of an Amsterdam storefront with bright yellow doors and table of potted plants on the sidewalk.